The popularity of the goji berry made it high demand items in the global market. The fact that the goji plant can adapt to a great difference in climate has made it possible for people to cultivate it in their kitchen gardens and even in pots. Now, in order to plant more, many people count on good Goji Berry Seeds which can be planted easily at home under ordinary conditions for better yield. How to Get Some Good Goji Berry Seeds? It is not difficult to get Goji Berry Seeds but most difficult task is procuring quality Goji Berry Seeds. Many people buy their seeds online and/or from people who already have a garden at home. Once you have procured the seeds, you will need to go through several steps before you have the goji seeds ready for plantation. The first thing is to prepare the soil well. Although Goji Berry Seeds are known to germinate in any type of soil, but for better results soil should be prepared with organic fertilizer. Try to avoid chemicals and pesticides to retain maximum benefits of Goji fruit. The best organic manure is from duck manure, cow dung, or seaweed fertilizer. You will usually get the seeds just ready to germinate and hence soaking for two to three hours will be sufficient for you to get the seedpod out. Then you need to scrape off the little seedpod on to a paper towel and place it on a large flat surface. In order to aid the germination process, you have to be very careful while planting the little seedlings in the germination pots. You should ensure that each pod has its own cup. You should usually push the seed around ½ inches inside and then cover the seed with soil, after it, sprinkle water on it. Keep the area dark and temperature at around 75 degrees Fahrenheit. 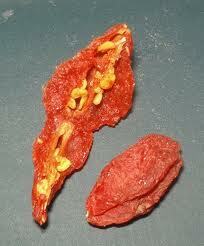 The Goji Berry Seeds planted this way generally germinate within 4-6 weeks. Wait until you see the seedling with two leaves and then transplant it to a big pot. You will need a pot of at least one-gallon capacity. Don't forget to fill the pot with well draining soil, as sludgy soil will kill the seedling.